One would think that being a hard-nosed, mature beyond your years, Cork Con outhalf is a recipe for success at Munster. Unfortunately for 22 year old Tomas Quinlan, his talent has never truly caught the eye of the Munster selectors, as he was released by the academy last Summer. 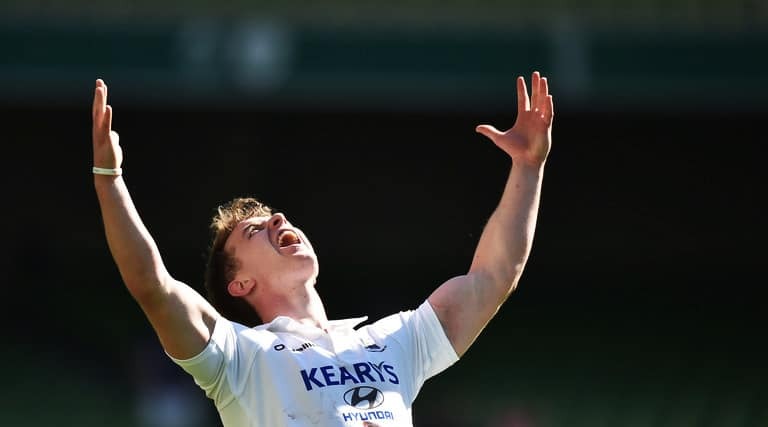 Quinlan first made a name for himself at the 2015 Junior World Cup when following an injury to Leinster outhalf Ross Byrne, he was promoted to the bench and sent out onto the field of play with five minutes remaining against Argentina. Ireland trailed 16-15. Having been called upon from the bench for his World Cup debut, the Corkman would have been forgiven for turning down a crucial, long-range, last-gasp shot at goal from the touchline. But he’s made of sterner stuff than that. Quinlan went through his usual routine, gathered himself and curled the ball over. Cool as ice. However, a year later he found himself without a Munster contract of any description. Munster/Munster A‘s loss has been Cork Constitution’s gain having won every bit of silverware available to them since – The Charity Cup, Munster Senior Cup, Bateman Cup and the AIL – Quinlan played every single game. So why then isn’t he playing professionally? Well it is rather likely that Munster don’t need reminding that they let a little gem go when it came to contract season in 2016. At the time it must be remembered that Ian Keatley, Tyler Bleyendaal and Johnny Holland were all on the books with a close eye also being kept on the since injury disrupted Bill Johnston. Now with just Tyler Bleyendaal and JJ Hanrahan senior team definites for next season the situation has changed significantly. And so there is suddenly a need for an outhalf to step up. Fortunately for Munster however, they won’t now be looking to a young guy who has played a handful of British and Irish Cup games over the last couple of seasons, but instead a lad that has grafted week in week out against men in the All Ireland League. Someone who has learned his trade by getting consistent game time at a competitive level of rugby. From Quinlan’s interviews, nothing suggests that Munster have planned this career path for the CIT student, but some clever decision making from his native province could yet brew up a perfect storm.